You are here: Home » 2009 » June » Barcodes on patient wristbands. Barcode.com: “Often times, information that Hospital administrators would like to include in the barcode is far too much in relation to the wristband space. While 1-D barcodes cannot always fit all of the information, they can be scanned by all types of barcode readers, unlike 2-D barcodes which can fit more information, but require a 2-D capable scanner. In addition, when the end of the barcode curve around patients wrists, it is difficult to scan, thus, it is necessary to choose a barcode symbology that will fit on the flat part of the wristband, but also hold all of the necessary information. Rather that choosing a UPC code, which is commonly used in retail applications, it would be wise to choose a dense barcode symbology, such as Code 128, which can hold a lot of information in a small amount of space.“ – Wristbands are a popular item for discussion in any barcode medication administration (BCMA) project. They’re just not user friendly. Even though 2-D barcodes require an upgraded scanner, I prefer them because of their small footprint. Their size allows multiple copies of the same barcode to be placed on the wristband in several strategic locations for easy access. 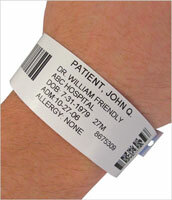 The difficulty associated with scanning a patient wristband is one more reason why RFID may be worth a second look. RFID on patients might be a privacy issue. Thoughts? Hmm, that’s a good point Carla. Depending on the information stored on the RFID tag, and the distance from which they could be read, that could be a significant issue. After speaking with a couple of industry experts yesterday, I think my RFID stance may have changed a little. It turns out that implementation is significantly more difficult than I could have imagined. I would like to use the picture of the hand with patient wristband that you have on your site. I would like to use it for an elearning for our employees for annual mandatory education. We are a hospital system with approximately 10,000 employees in Cincinnati, OH.